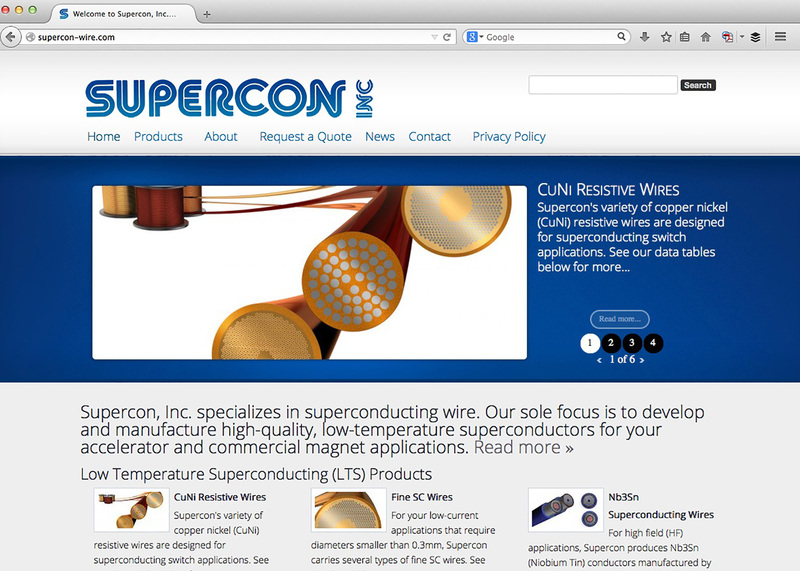 A new website offering high quality super- conducting wire for accelerator and commercial magnet applications has been introduced by Supercon, Inc. of Shrewsbury, Massachusetts. The Supercon Website describes the superconducting wire and cable products and expertise offered by this firm which specializes in low-temperature superconductors (LTS). Standard products include mono- and multi-filament NbTi (niobium titanium) superconducting wires; Nb3S (niobium tin) super-conducting wires; wires with a wide filament count, filament size, and copper-to-conductor ratio; and CuNi (copper nickel) resistive wires for switches, and fine SC wires requiring diameters smaller than 0.3mm. Providing complete product descriptions and specifications, the Supercon Website highlights the firm’s ability to produce specialty conductors such as Very Small Filament (VSF) NbTi Superconducting Wire featuring hundreds of NbTi filaments and High Field NbTi Superconducting wire containing the maximum amount of NbTi possible. Insulation fabrication capabilities and specifications are also included. The Supercon Website can be visited at www.supercon-wire.com .